I am notorious for buying supplies then taking forever to utilize them. I behaved true to pattern with the Pilot Parallel Pen. In fact, I must confess that I couldn't find it in its unopened package for awhile because it had burrowed under papers on my desk (it was hibernating...). Having recently uncovered it, I decided to give it a try. At right is today's effort. In some ways, it's a cool pen. It has a parallel nib design that's supposed to make it easier to write calligraphy. I haven't written with a bonafide calligraphy pen in awhile, so I can't attest to whether this pen flowed more easily or not. I do like that this pen uses ink cartridges instead of necessitating dipping the nib into an ink pot. It's cleaner this way. However, I feel disappointed with the pen. It comes with two ink cartridges, and with a name such as Parallel Pen, I thought I'd be able to use the two colors at the same time. Of course the Amazon.com ad copy that says "Two different ink colors can flow from the same nib for a beautiful graduated effect" might have contributed to that illusion. Well, upon reading the instructions that come with the pen, it technically can do that, but only if you have another Parallel Pen to assist with the process. I strongly dislike being misled like that, especially when getting the expected effect requires additional expense. As well, and I admit I made an assumption about this, you cannot change ink colors until the current cartridge is used up, unless you want to waste ink. So, once you attach a cartridge to the pen, you're committed to that color. As you can see in my picture, I am currently committed to red. And that "blood spot"? That's the result of my attempts to get the ink to flow. That did not happen easily, so you have to have a paper towel, napkin, or scrap paper handy when you're trying to squeeze ink from the cartridge into the nib to create ink flow. I'll continue to use this pen and see if I can become more familiar with it. When I do, I hope I'll enjoy using it more than I did today. 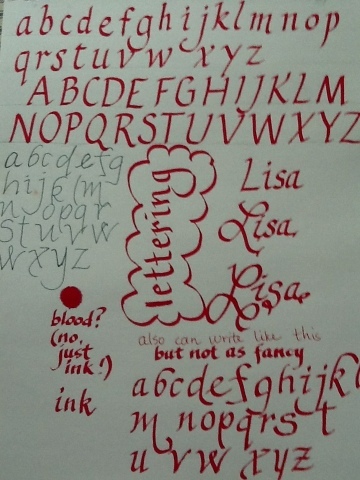 I do want to practice my lettering--as you can see, I need to work on consistency of letter sizing--and having a fun pen is always incentive to do that. As I do, if I discover anything cool about the Pilot Parallel Pen, I'll let you know.